Introducing solids to your baby can be a fun time. Here’s a colorful and easy recipe you can try today. In the following recipe, either Neocate® Syneo® Infant or Neocate® Infant DHA/ARA can be used. For nutritional information when using Neocate Syneo Infant, please see ‘Nutritional Information’ section below. For nutritional information when using Neocate Infant DHA/ARA, please see the ‘Notes’ section below. 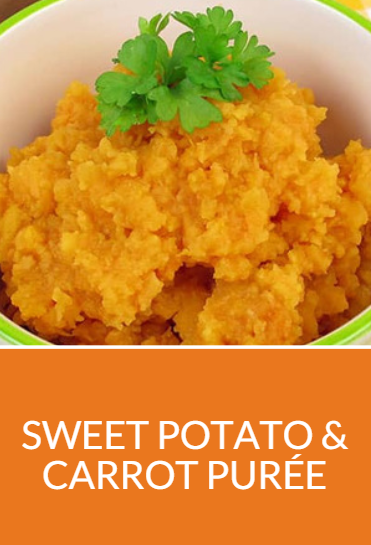 Place the sweet potato and carrot in a small saucepan with the water. Cover and simmer until tender, allow to cool. Blend the vegetables and cooking water until smooth using a food processor or hand blender. Distribute mixture among 3 containers. Refrigerate or freeze remaining servings until needed. Just before serving, add 1 scoop of Neocate to each serving of purée.